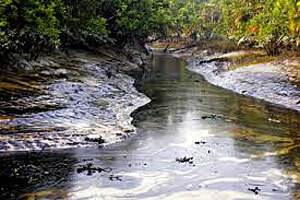 Unfortunately spills of oils, fuels and other pollutants are released into waterways, culverts or drains that flow into rivers, streams and ditches causing a pollution incident. In most cases this is accidental although sadly it does happen that pollutants are illegally discharged. Should you become aware of this please do contact us. 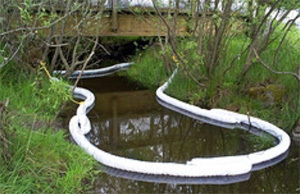 We are equipped with full aquatic spill kits and can respond to a harmful spill in a timely and efficient manner. We use the best materials specified for use in water and dispose carefully of the waste arising from cleaning up the contamination. In the event of installing oil absorbent booms we can also arrange to collect and dispose of these to ensure that you and your staff comply with waste handling legislation to protect yourselves and the public. If known, it is important that you tell us what the pollutant is and provide a copy of the COSHH certificate. In the event of unknown pollutants, we may have to treat this as hazardous waste and bring in specialist waste handlers. It is extremely important to respond rapidly to spills in the aquatic environment to prevent long term harm to aquatic species, wildlife, livestock and domestic pets. Please note that we can also offer a full testing service to measure levels of oils, total petroleum hydrocarbons and other pollutants to better understand the extent of a pollution incident.